PUEBLO, Colo. – It may be a new year with 2017 ringing in loud and clear, but it will not be a new bull riding season for PBR veteran Kasey Hayes. Hayes announced on Tuesday afternoon his retirement following a 12-year PBR career. “Finally, I was like well, ‘I think it is just time,’” Hayes said. “I don’t even look forward to next year. All of this past year I thought, ‘Is this right? Should I be doing this? The 31-year-old qualified for the Built Ford Tough World Finals eight times in his career after first winning his Built Ford Tough Series debut in 2006 by going 3-for-4 in Tulsa, Oklahoma. “I just remember showing up and treating it like another bull riding, and it paid off,” Hayes said. Hayes concluded 2016 35th in the world standings and was fresh off a third consecutive Finals qualification. The Liberal, Kansas, cowboy finished his career 173-for-589 (29.57 percent) on the Built Ford Tough Series with four victories and nine 90-point rides. Hayes added that he was happy to retire being relatively healthy. Hayes won two of his four events with career-high 92 point-rides. He first reached the 92-point threshold in Winston-Salem, North Carolina, in February 2008 when he conquered Camo to win the North Carolina Invitational. He then won the Baltimore Invitational the following season with a 92-point ride on Mac Nett’s El Presidente. Hayes’ best season came in 2007 when he finished 12th in the world standings by going 28-for-84 in 30 events. In 2014, Hayes put together two of his most memorable rides in back-to-back weeks. Hayes became the first rider to conquer the 2,000-plus pound Mississippi Hippy for 88.5 points in Des Moines Iowa, before riding Shepherd Hills Tested for 91.5 points the next week in Colorado Springs, Colorado. 2014 was a resurgence for Hayes. He had missed the PBR World Finals three seasons in a row before he stopped drinking and reprioritized his life. According to Hayes, he hasn’t drank a drop of alcohol since giving it up at the conclusion of the 2013 season. “I guess you could take pride in that, but it was just one of those things I needed to do,” Hayes said. Hayes said one of the first people he told that he was done with bull riding was his good friend Stormy Wing. Wing traveled up and down the road with Hayes and remembered having to drive Hayes home from a Touring Pro Division event in Colorado Springs in 2015 when Hayes sustained a concussion. Hayes and Wing have hosted the Kasey Hayes and Stormy Wing Invitational the past three years. Wing said one of his favorite rides from Hayes came in Guymon, Oklahoma, two years ago when Hayes covered DaNutso for 92 points. “That was rank,” Wing said. 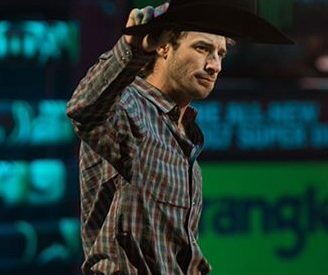 Hayes, who has always taken on various investment opportunities, says he plans to work full time for his oil business now that he is leaving bull riding. “I’m going to retire to my oil field company and hope the oil fields pick up,” he said. Hayes thanked his fans for their support over his career and had one final message for them. “Read your Bible. There is truth inside it,” he concluded.